Randhir Singh Heer and Parmjit Singh Bahia started the Midland Langar Seva Society, which offers an open kitchen to “all and everyone” in need of food every night of the week. Rooted in 500-year-old Sikh traditions of offering open kitchens at temples for anyone of any background, the charity’s teams of volunteers distribute hot food, treats and clothes to the community in Walsall, as well as Birmingham, Wolverhampton, Coventry and Leicester. A team of volunteers serve around 5,000 meals a week to the needy in 15 towns and cities. They rely on local people donating food, and also support school breakfast clubs. Now Randhir and Parmjit have been presented with the Pride of Birmingham TSB Community Partner Award. Randhir said: “Although the open kitchens provided by the Midland Langar Seva Society have their roots in Sikh tradition, we support all and everyone in need of food. Pride of Birmingham, in partnership with TSB, honours unsung heroes of all ages who do extraordinary things to help others. The pair received the Award on behalf of the charity at a star-studded dinner hosted by TV presenter and campaigner Katie Piper, and attended by some of the region’s biggest stars. Bumping into an old school friend in 2013 had a profound effect on Randhir Singh Heer. While out shopping with his wife, he spotted his former pal and stopped to say hello. 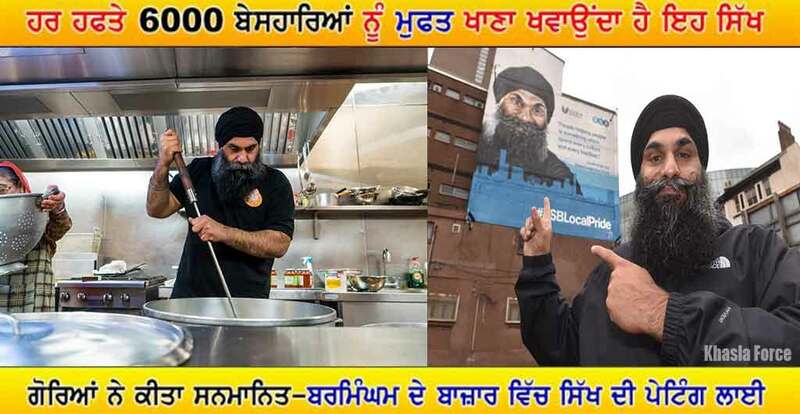 So Randhir and his childhood friend Parmjit Singh Bahyia set up the Midland Langar Seva Society (MLSS), inspired by 500-year-old Sikh traditions of offering open kitchens at temples for anyone of any background. Relying on food – never cash – donated by the local community, they started feeding the homeless in Walsall on a daily basis. Realising their impact, they started doing the same in Birmingham, and the MLSS now has more than 200 volunteers across the UK – men, women and children – serving about 5,000 meals a week in 17 towns and cities, as well as supporting school breakfast clubs and children’s centres. It has even gone worldwide. They now also have three big teams in India, and another about to launch in California. Randhir is a warm and humble presence, even as he recalls some of the people he has helped – from the man who got ill and severely depressed while living in a tent in a local park with his girlfriend (Randhir and Parmjit paid for a flat for them for a month on the condition that they found work to keep it on themselves, which they did) to the man he approached at a bus stop because he looked upset. “It was about a year ago,” recalls Randhir. “I went over to see if he was OK and if there was anything he needed. He told me he’d lost everything. His marriage of 27 years had ended and he’d lost job and his home. He wanted to end it all. “He ended up crying on my shoulder. I could tell he needed some purpose so I told him we were short of volunteers and suggested he help out. He did, and so then I started sending him to Blackpool with a team of our lads every Sunday. He made friends. That same guy is now in India, having set up our Team Punjab, serving up to 800 people a week. But despite all the lives he has changed – and even saved – Randhir’s unassuming nature means that winning the Pride of Birmingham TSB Community Partner Award comes as a huge shock. Andy Armitage, regional branch distribution director at TSB, said: “The winner of TSB Community Award could not be more deserving. This award is about us recognising local people working in partnership with other people to address a need in their community. For Randhir, the satisfaction of helping others is his reward, and his goals are focused on what more he can do to help those most in need. He and his team are currently raising money for their next project: Guru Nanak Langar Bus. “I want to offer somewhere where homeless people can come for shelter to enjoy a hot meal and a warm drink,” he explains. It remains Randhir’s belief that the best way we can help the people who need it most is to give them our time. “Giving just a minute to a homeless person could save their life,” he insists. And that’s why it’s a charity for absolutely anyone who needs help, regardless of its Sikh roots.